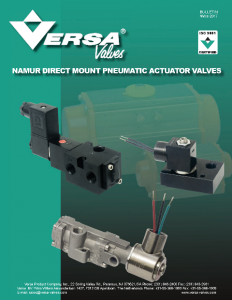 Versa E5 NAMUR is a 3-way control valve designed to mount directly onto a spring return rack and pinion actuator. This reduces installation time while increasing actuator response time. The Versa NAMUR mount control valves are high flow, bubble tight, direct acting or solenoid/pilot operated. They are designed to mount directly to any NAMUR actuator, thus reducing actuator response time and cost of tubing, fittings, brackets, and labor. These valves are available in two materials – Aluminum and 316L stainless steel. E5 is a direct acting 3-way (3/2) solenoid valve. C5 and C316 are solenoid/pilot operated high flow, 5-port NAMUR valves. 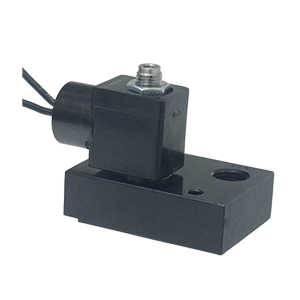 They are available as single or double solenoid 2-position (C5 – C316) and 3-position (C5) models. Single solenoid spring return models utilize an air assisted spring return feature, assuring a positive return. Double solenoid valves may be used in applications where a momentary signal is required or in a “fail in last shifted position” actuator application. A complete selection of electrical connections, area classifications, and power requirements makes the most exacting and demanding specifications or applications easy to satisfy.